Adis says:Welcome to Quicksketch Sunday! If you voted this week, you saw the sketches and you knew the spotlight would be on Squaresville, by the entity known only as K.W. (but you can call him Kenny.) Squaresville tells the story of Steve and his demon roomate, but let's here what he has to say, shall we? Who are you and what is this "Squaresville" people talk about? Some people call me a space cowboy. Some call me the gangster of love. 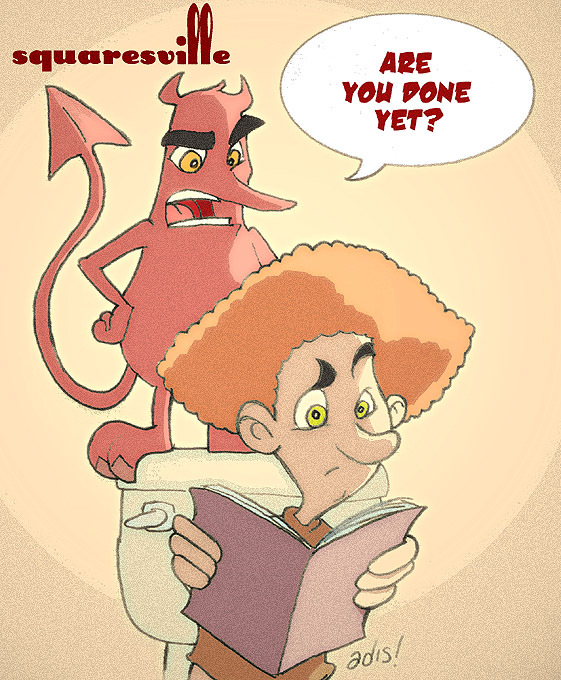 I draw a little comic called "Squaresville" that has been causing quite a frenzy throughout the nation. And by "nation" I mean internet...And by "frenzy" I mean "apathy". For all its cutting edge, your work seems to have some strong comic strip roots. Who are your influences? I'm kind of like a sponge. Pretty much everything out there influences me in some way. Probably most of my influences spawn from non-comic origins, but as far as traditional strips go, there are a few. Back when I read the "funnies" religiously- Calvin and Hobbes, Far Side, and Peanuts were pretty much the Holy Trinity of comics as far as I was concerned. Pogo was brilliant from what I'm told, and when I was younger I read a lot of MAD Magazine, so Don Martin was definitely a big influence on me. How did those lead to wanting to do your own webcomic? My story probably doesn't differ from anyone else's too much. Growing up I was either drawing comics or reading them. Then one day the neighbors dog instructed me to start a webcomic. You know, that old story.The internet is great because it's so easily accessible, for both the artist and the audience. No editors, no politics, no talent, no problem! And how did you come up with the idea for a demon roomie? Seeing as how I've never actually roomed with one, it's hard to say. I think the concept began when I drew the strip's main character Steve. He just sort of looks like he's asking for it. Like he's the universe's whipping boy. I think we can all relate to that in some way. Please tell me Steve hair's is not based on yours. Anything you want to say to those who don't like your patterned backgrounds? What's up with that? Stop hatin' on my wicked fly patterns, yo! I'm glad someone finally noticed the deep sociopolitical relevance of my strip. The people united will not be defeated, Adis!!! No justice, no peace! How do you manage to make a (mostly) daily comic? One day at a time. One gut wrenching, hair pulling, sleepless day at a time. What can we expect from Squaresville in the future? Well, the comic's been around for about 6 months now, and I'm finally getting a feel for where I want to go with it. For example, I might fix those broken links on my main page. So be looking out for that. And if you thought the sexual tension between Shirtless Bob and Lenny was thick now, just wait until things heat up in January. What's your favorite CYS strip? You know, they are all so groovy that I have trouble deciding. But since I want to look cool and indie, I'll probably try picking something obscure, like Ramon the Well Intentioned Scuba Diver Who Just Can't Commit, or the one with the girl at heaven's front desk, explaining the cat incident. Of course, Ship is my main man so I can't leave him out either. You can all thank Kenny for the highly amusing interview by visiting Squaresville, and I hope you enjoyed my take on his characters. See you tomorrow!